The Imperial Crown of the Holy Roman Empire (German: Reichskrone) was the hoop crown (German: Bügelkrone) of the Holy Roman Emperor from the 11th century to the dissolution of the Holy Roman Empire in 1806. The crown was used in the coronation of the King of the Romans, the title assumed by the Emperor-elect immediately after his election. It was made in the late 10th or early 11th century. Unlike many other crowns, it has an octagonal rather than a circular shape, and is constructed from eight hinged plates. The plate in the front of the crown is surmounted by a cross, with a single arch linking it to a plate at the rear of the crown. The crown is now exhibited at the Hofburg in Vienna. The crown was made probably somewhere in Western Germany, either under Otto I (with additions by Conrad II), by Conrad II or Conrad III during the late 10th and early 11th centuries. The first preserved mention of it is from the 12th century—assuming it is the same crown, which seems very probable. Most of the Kings of the Romans of the Holy Roman Empire were crowned with it. Along with the Imperial Cross (German: Reichskreuz), the Imperial Sword (German: Reichsschwert), and the Holy Lance (German: Heilige Lanze), the crown was the most important part of the Imperial Regalia (German: Reichskleinodien). During the coronation, it was given to the new king along with the sceptre (German: Reichszepter) and the Imperial Orb (German: Reichsapfel). 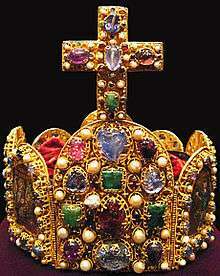 The Imperial Regalia of the Holy Roman Empire, especially the Imperial Crown, were kept from 1349–1421 in Bohemia (now in the Czech Republic), where the Carlstein Castle was built to protect them. Between 1424–1796 they were all kept in Nuremberg, Franconia—and could only leave the city for the coronation. Currently, the crown and the rest of the Imperial Regalia are exhibited at the Hofburg in Vienna—officially "until there is again a Holy Roman Emperor of the German Nation". An identical copy is in Aachen in Germany in the Krönungssaal of Charlemagne's former palace, now the town hall. There are also copies of the crown and regalia in the historic museum of Frankfurt, as most of the later Emperors were crowned in the cathedral of the city, as well in the fortress of Trifels in the Electorate of the Palatinate, where the Imperial Crown was stored in medieval times. The newest authorised copy is kept in the Czech castle of Karlštejn along with a copy of the Crown of Saint Wenceslas. The Imperial Crown does not look like most more modern crowns. The crown does not have a round shape, but an octagonal one. Instead of a ring, it has eight hinged plates which are arched at the top. Two strips of iron, riveted with golden rivets to the plates, hold the crown together and give it its octagonal shape. At what point these iron strips were installed is unknown. Before the addition of the rings the plates were held together by long golden pins thus making it possible to separate the plates and the arch for easier transport. Each plate of the crown is made out of a high carat gold, around 22 carats, which gives the crown a "buttery" colour, and is studded with pearls and precious stones. The stones are not cut into facets (a technique still unknown when the crown was made), but rather polished into rounded shapes. This technique is an ancient one and gemstones like this are described as being "en cabochon", which are still made to this day. The pearls and the stones were put into openings that were cut into the metal, and fastened with thin wires. The effect was that when the light shone in, the stones looked as if they would shine from within. The crown is decorated with 144 precious stones (including sapphires, emeralds and amethysts) (green and blue precious stones being proper to emperors in Byzantine imperial protocol) and about the same number of pearls. Similar gem-studded styles of decoration were used for precious objects of a number of types at this period, in particular religious ones such as reliquaries, crux gemmata or, processional or altar crosses such as the Cross of Lothair, and book-covers such as that of the Codex Aureus of St. Emmeram and Codex Aureus of Echternach. Four smaller plaques bear pictorial representations of figures and scenes from the Bible and inscriptions in cloisonné enamel, in the Byzantine senkschmelz style. The four plates, called 'picture-plates' (Bildplatten) each shows representations from the Old Testament. Each of these enamelled plates is surrounded by blue sapphires and pearls in raised filigree settings. The Front Right Plate shows Christ in Majesty between two cherubim beneath the inscription in red enamel P[er] ME REGES REGNANT "By me kings reign" (Proverbs 8:15). The Back Right Plate shows the Prophet Isaiah standing and speaking to King Hezekiah, who is shown sitting on his bed. Isaiah holds a scroll with the words, "Behold, I will add fifteen years to your life" (II Kings 20:6). Above both Isaiah and Hezekiah is the inscription in red enamel ISAIAS P[ro]PHETA · EZECHIAS REX "Prophet Isaiah - King Hezekiah". The Front Left Plate shows King Solomon holding a scroll with the words, "Fear the Lord and flee from evil" (Proverbs 3:7), beneath an inscription in red enamel REX SALOMON "King Solomon". The Back Left Plate shows King David holding a scroll with the words, "The renowned king delights in doing justice" (Psalm 99:4), beneath the inscription in red enamel REX DAVID "King David". The other four plates, called 'stone-plates' (Steinplatten), are of differing sizes and are decorated solely by precious stone and pearls in raised filigree settings. The twelve stones on the front and back plates are probably a direct reference to the twelve stones of the Jewish high priest's breastplate (cf. Exodus 39:9-14) and to the twelve foundation stones of the New Jerusalem in the Revelation to John (Cf. Revelation 21: 19-21). The orphan is a jewel in the crown of the Roman emperor. Because the like of it has never been seen elsewhere it is called the "orphan". It has the color of wine, of delicate red wine and it is as if the dazzling, white of snow penetrates the bright wine red and yet it remains dormant in this redness. The gem shines powerfully and it is said that it once even shone at night, but not in our time, but it is said to preserve the honour of the empire. How or why it was removed from the Imperial Crown is not known. The last mention of it is in an inventory ordered by Charles IV in 1350. The crown has a single arch from the front to the back plate with the name and imperial style of Conrad II in seed pearls On the left side of this arch these seed pearls spell out the words CHUONRADUS DEI GRATIA "Conrad, by the Grace of God", while on the right side they read ROMANORU (M) IMPERATOR AUG(USTUS) "Emperor of the Romans (and) Augustus". Above the front plate and in front of the arch is a jewelled cross, originally a pectoral cross said to have belonged to Henry II. and only later attached to the Imperial Crown. There are also three small holes on each of the two side stone-plates from which chains with pendant jewels, known as pendilia, like those still found on the Hungarian Holy Crown of St. Stephan probably hung. The present red velvet cap on the inside of the crown dates from the 17th century. Before this the imperial crown was worn over a miter. If originally the form of the miter the imperial crown was intended to be worn over had the form of the Byzantine 'camelaucum' the arch would have depressed the centre of the now collapsed inner cap causing it to bulge up on either side much as the embroidered ribbon from front to back on the eleventh century bishops' miters caused their linen fabric to bulge up on either side. Thus the Imperial Crown appears to be the earliest form of the miter crowns worn by the Holy Roman Emperors as a singular privilege of their imperial office. The Imperial Crown was also the inspiration for the heraldic crown adopted in 1871 for the coat-of-arms of the German Emperor and Empire, although the latter crown had four half-arches supporting a small orb and cross, rather than the single arch of the original. The Imperial Crown of the Holy Roman Empire was selected as the main motif for a high value commemorative coin, the €100 Imperial Crown of the Holy Roman Empire commemorative coin, minted in 2008. 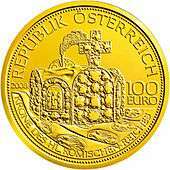 The obverse shows the Imperial Crown of the Holy Roman Empire. The reverse shows the Emperor Otto I with the Old St. Peter's Basilica in Rome in the background, where his coronation took place. ↑ The depiction of the Lord of Host or God the Father as a Holy Roman Emperor becomes commonplace in medieval art (e.g., the Vienna Coronation Gospels), thus, in turn making the emperor himself a living image of God in medieval political thought and imperial propaganda. ↑ The reverse side of the cross has an engraving of the crucified Christ. ↑ Pendilia also hung from the Byzantine emperors' crown (Cf., e.g., the mosaic portrait of Justinian in the church of St. Vitale in Ravenna). ↑ Reichskrone German Wikidepedia site. The only other extant example of an imperial miter crown is the Austrian Hauskrone made for Emperor Rudolf II. Wikimedia Commons has media related to Imperial Crown of the Holy Roman Empire.